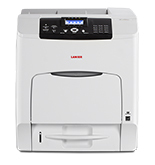 Give your audience the information it wants every time with the LANIER SP C440DN color laser printer. Impress with high-quality color output on a wide range of media. Take advantage of an extremely low cost per page. And transition between jobs quickly and economically. With the printer’s second network port, you can connect to two networks at once. Keep the LANIER SP C440DN on your standard network while adding it to a guest network, so visitors can print — without having to access the corporate (or your standard) network and potentially compromising your internal data or applications. Work takes you everywhere — now you have a printer to support you. Send documents directly from your smartphone, laptop or tablet directly to the RICOH SP C440DN so you can print and share information from anywhere on the same network. What you’re sharing is important, so get your information across with vibrant colors and sharp text at up to 1200 x 1200 dpi. Eliminate outsourcing — custom PANTONE® color palettes (available February 2016) help you get the most accurate reproduction of PANTONE Matching System® CMYK process colors, so you can ensure your logos, borders and other graphics look their best. Keep tabs on your most important asset — information. With user authentication and locked print, you can help protect a document by restricting access to authorized users. Set up to 1,000 user codes to monitor user activity and set volume limits. Limit the number of IP addresses that can connect to the printer with IP address filtering. SSL/TLS protocols help keep network data from being intercepted.